When we bought our house nearly four years ago, one of the little details that charmed us was this outbuilding. There are two outbuildings; I find the other one significantly less charming, mainly because it is dark and creepy and full of spiders and chipmunks who knows what all. It’s where we keep the garbage can and lawnmower and garden implements and snow tires and ice melt. No, as you’ve inferred, we do not have a garage. Every year we talk a little more about the garage we plan to have. It’s one of the things we talk about. But that’s another blog for another time. Note, to the right, remnants of the tall pine that just barely did NOT fall on the little house. 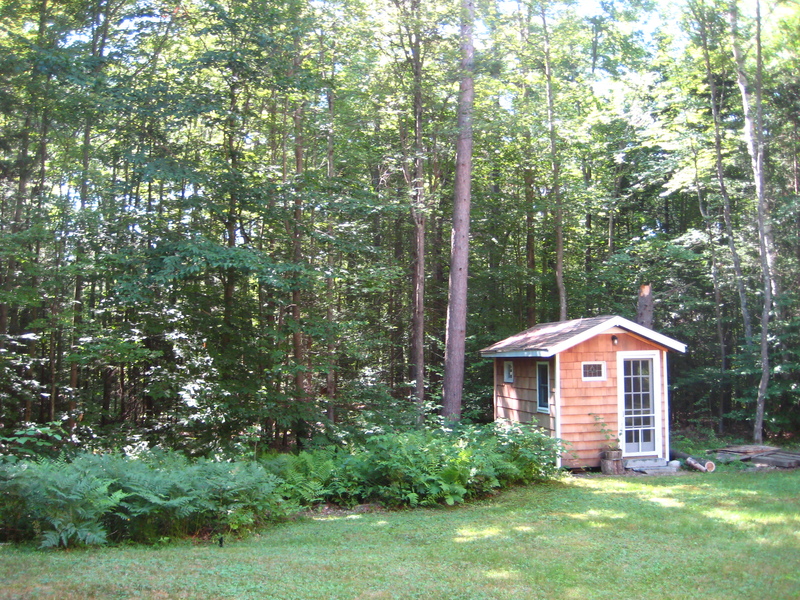 So I’ve been working to get the little house outfitted, with the idea that it will be a kind of three-season writing retreat, and possibly a summer/early autumn bunkhouse if I put a daybed in there. The place has electricity (!) with two plug-in outlets, two vanilla ceiling fixtures, and even a little “porch light.” I haven’t spent any significant time there in the winter, and don’t plan to, but it will certainly work for spring/summer/fall. So far I’ve just got a few of the very basics in there — a writing desk and chair, a big wicker reading/lounging chair (still needs another cushion), and a little side table. I think I need some storage — a shelf and/or bin and/or drawer situation. I believe I’ll be laying down this old oriental carpet I haven’t used since we moved here. I’ve got a little desk lamp, but may keep my eyes open at the yard sales for a floor lamp as well. And the daybed. Along the back wall. Chaise lounge? I got the writing desk and wicker chair at a great yard sale in Peterborough — $27 for both. The view as I stand just outside the door. Trying to give a sense of size/scale. I was down in that part of the state to attend a poetry reading by Marilyn Annucci and Pat Fargnoli at Toadstool Books, and hit half a dozen or so yard sales along the way. It was a great reading, and somehow fitting that two major pieces for the writer hut (writing house? 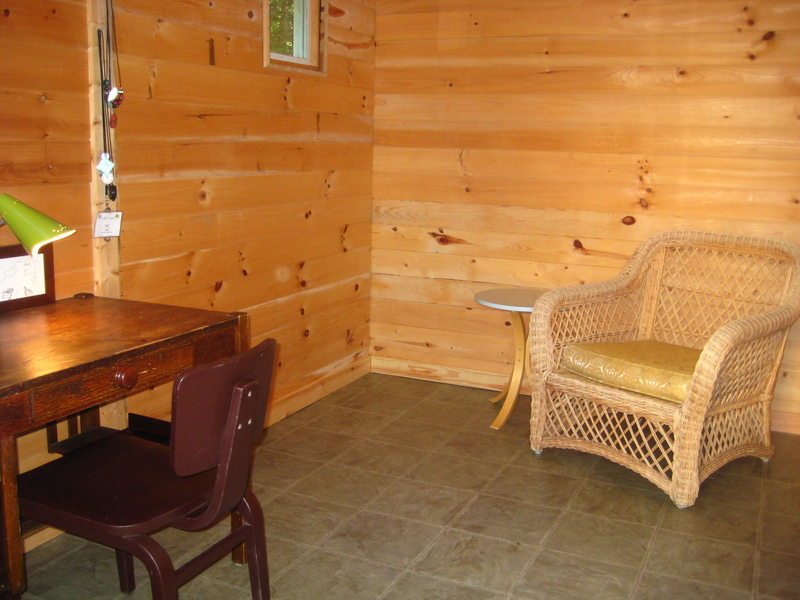 writing shed? retreat?) were acquired on my way to hear them read their outstanding poems. 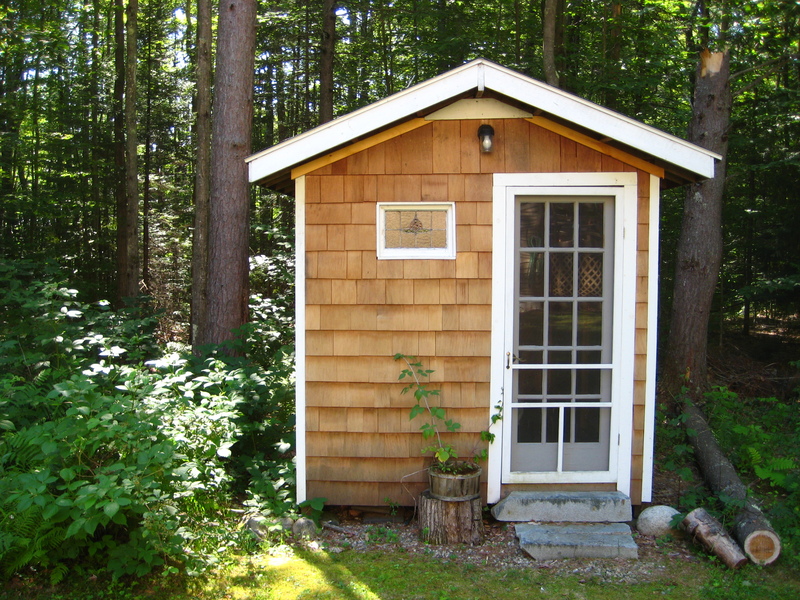 I haven’t tested this theory yet, but I believe that one of the slight disadvantages of the location of the writer hut is that my wireless internet will work out there. If I get into a routine of going out there to work, I should probably plan on turning off the router on my way out. Yes, internet trolling is a legitimate part of the writing/research/thinking process, but it is also a distraction, and I think that having an internet-free space (at least SOME of the time?) is probably a good thing. So, yes. 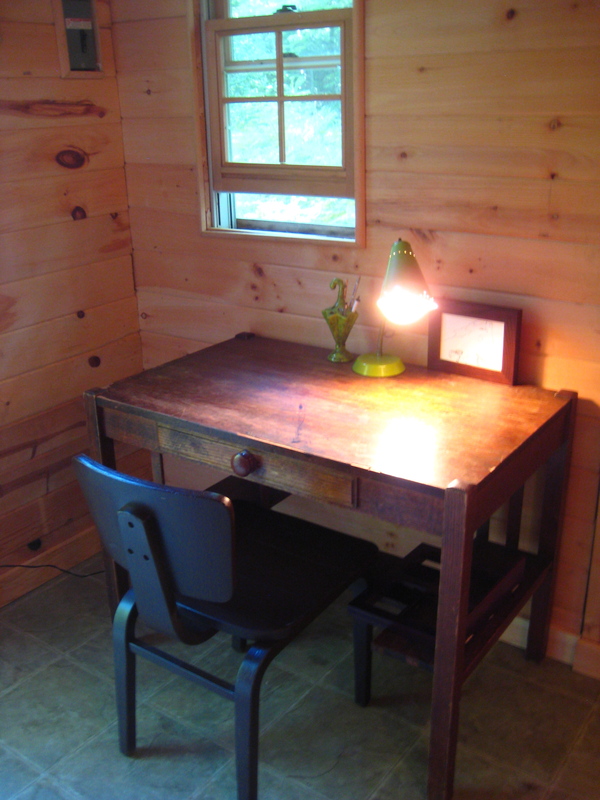 The writing hut. Any suggestions about what all I need in there? What have you got in your writing space? What has helped to lure you into your writing space and what keeps you there? Yeah, it’ll definitely be warmed up by the rug. Am thinking about having a daybed against that back wall…though I want room for the chair also. The wicker chair is actually massive, don’t know if the picture conveys its enormity. Just big enough, I think. Love the hut. I think it would be warmed up by a picture of me, but otherwise, your plans sound wonderful. Oh Charlotte. Great idea! And you know which picture I’d want, don’t you? A certain white-collar-purple-tie-big-glasses elementary school portrait? It will inspire me daily. This is very Thoreau. All you need is that cot/daybed, a flute and a small field of beans (complete with woodchuck) and you’ll have it all. . . this is fantastic Liz. Great work! A flute! I knew I’d forgotten something. Not sure we get enough light for beans. I’m just going to count the multiple tiny critters living in the ceiling as equivalent to one (1) woodchuck. That looks lovely! Since it has electricity, maybe you could put a mini-fridge in there? Suppose you get hungry while writing, having a mini-fridge in there will save you the hassle of going to the main house to grab something, and prevent you from getting distracted. I would need a small thing to make coffee or tea, even if it was just one of those small immersion coils that plugged into the wall that you dip into the cup. And definitely a bookshelf, small, rustic, to hold reference books, but other than that, sparse is good. It is beautiful. this is such a beautiful little place. i wish i had one in my backyard, but it would just serve as an oven for three seasons here. i like the idea of a daybed. you will of course need a quilt on top of it. maybe one that is made of green fabrics. Wow…this is so beautiful–simple, clean, meditative. The wood is so pretty. 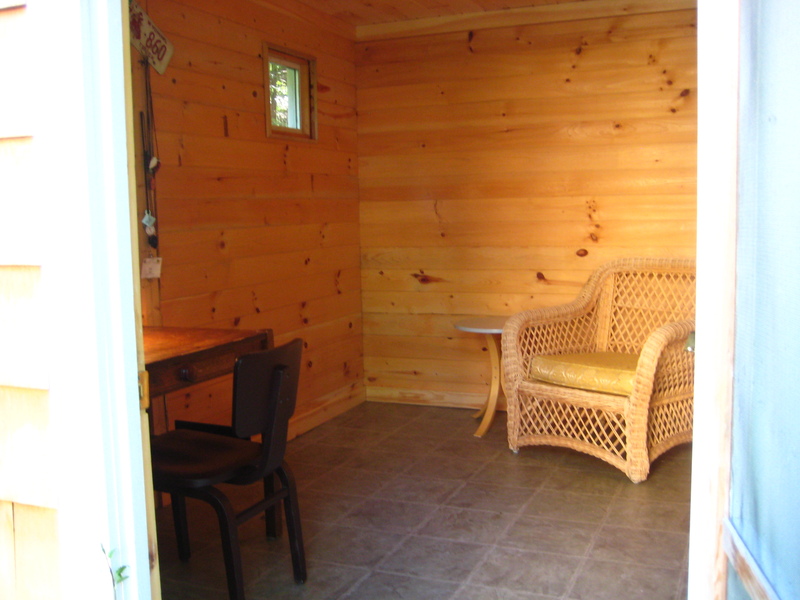 I want a writing hut! By the way, I ordered your new chapbook but it still hasn’t arrived. I wonder why not–maybe you could ask the editor at Kitchen Table Press, or I’ll e-mail them. Thanks, Marilyn! Do give Seven Kitchens Press an email; the editor has had some difficulties recently and is in catch up mode, but I do think he’d appreciate a reminder! Sorry for the delay, as I really do appreciate your support!